“The Son of Man came eating and drinking, and they say, ‘Here is a glutton and a drunkard, a friend of tax collectors and sinners.’ But wisdom is proved right by her deeds.” (Matthew 11:19). Our lives aren’t governed by luck or chance, but rather by the will of God. The Lord allows our interaction and engagement with people who don’t believe in Jesus or who differ in their opinions about matters of the faith. The key to being Christ-like in these situations is to keep your eyes on Christ and not the person. You can have the mind of Christ when depending on the Holy Spirit for direction. For more study read Matthew 11:1-19. “Peter and the other apostles replied: ‘We must obey God rather than human beings!’” (Acts 5:29). There will be times in a believer’s life when they will be tested for what they believe about God and the Bible. There are believers who refuse to deny Christ resulting in a risk to their lives, livelihood, and peace. There are rich blessings over those who choose God over men even though they lose out in earthly treasures. 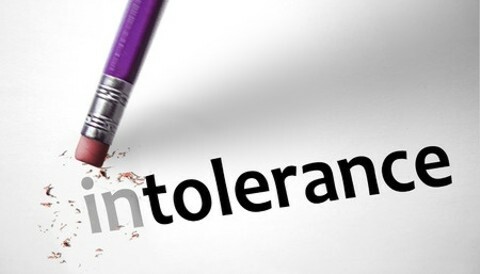 Christians must develop an intolerance to any behavior that would cause them to disobey God’s word. For more study read Acts 5:27-42. “If you really keep the royal law found in Scripture, ‘Love your neighbor as yourself,’ you are doing right” (James 2:8). The most intolerant of individuals can recognize true and unconditional love from Christians. Loving those who are intolerant of the Christian faith empowers the believer to love just as Jesus did. The love from God is proactive and real without hypocrisy. Love overcomes a multitude of sins allowing the Lord to penetrate the hardest of hearts. For more study read 1 Corinthians 13. The Lord uniquely created each of us with our own personalities and preferences; therefore, we won’t always agree with one another. However, this doesn’t mean that we can’t still love and respect each other in spite of our differences. Those who belong to the god of this world may never comprehend the views of Christians—and we must expect that because the wisdom of God is foolishness to the world. For more study read Acts 15:36-41 and 2 Timothy 4:11). It’s possible with the help of the Holy Spirit to respect other’s opinions with grace. The ability to rise above personal feelings and treat someone with respect in spite of their intolerance reveals the true measure of spiritual maturity. The Spirit of God will always lead the believer towards graceful interaction with the intolerant. Having a mindset of prayer and quietness brings peace in the midst of differences. For more study read Daniel 4:19-37. There is a balance in which we must be patient and tolerant towards people, but intolerant of sinfulness in our own hearts and around us. “But even if you should suffer for what is right, you are blessed. “Do not fear their threats; do not be frightened” (1 Peter 3:14). Being labeled “intolerant” for your Christian faith is a part of the journey. Suffering is expected when you stand up for what is right according to the word of God. The devil and the world will push you to recant your faith in a loving Father. However there’s blessing from heaven on the lives of those who stake their faith in Christ without wavering when mistreated. For more study read 2 Corinthians 11:23-12:10. Forgiveness is the tolerance that defines Christian behavior when dealing with those who are intolerant. Bitterness takes root when a believer allows the insults to penetrate their hearts instead of choosing to forgive. Keeping the focus on what God wants for your life will help you to more easily forgive the intolerant and increase your capacity to deal with them. For more study read Matthew 5:43-48 and 1 Thessalonians 5:15. Those who demonstrate true tolerance will seek God’s wisdom and discernment before speaking with people who disagree with them. The wisdom of God digs deeper than surface beliefs and may cause a person to reflect on righteous concepts. It’s wise to demonstrate in words and actions the tolerance or intolerance the Bible teaches. For more study read Daniel 1. “Paul replied, ‘Short time or long—I pray to God that not only you but all who are listening to me today may become what I am, except for these chains’” (Acts 26:29). Believers reveal their tolerance for righteousness by how careful they express their opinions. Talking without thinking or praying causes many Christians to stumble in their response to those who are intolerant towards God and the Bible. Being slow to speak and quick to hear allows us the opportunity to fully understand how to address those who may be in opposition to the truth. For more study read Acts 26. “I have become all things to all people so that by all possible means I might save some” (1 Corinthians 9:22). The Christian faith is often misunderstood and we are labeled as “intolerant” to the ways of the world. This is expected as we are sojourners and ambassadors in the world. There is a balance in which we must be patient and tolerant towards people, but intolerant of sinfulness in our own hearts and around us. Always keep in mind that there are lost people needing to hear the truth about Jesus. May we become all things to all people in order that by our words and actions that many will come to know the Lord. Great Article on an important topic. I started writing opinion pieces back in the late 80’s about our societies ever increasing intolerance in the name of tolerance. Mainly, as you pointed out it involved society’s ever increasing tolerance of all opinion as long as those opinions did not differ from their own. I also understand your position on respect for others in the midst of our disagreement with them. I would suggest a definition on this point of “respect”. D. Bonhoeffer’s idea of respect was to join in an assassination attempt upon Hitler’s life. He reasoned that God was calling him in that direction. Have you read Mataxes recent biography of Bonhoeffer titled the same. Bonhoeffer did not survive his decision. He did not respect Hitler. While being civil to the abortion and LGBT lobby and cadre which are sweeping our country I, who call myself a Christian am anything but respectful to their position or to them. Now, I am civil( I don’t yell, spit at them, or call them names), although they have done this to me. So yes, I despise their beliefs. I try and ask God to help me love them and will share with them about Salvation, although this lobby knows already my position, and are pretty well decided upon their course. It is the “others” I hope to influence who are watching and listening. So I remain civil, but I do not define this as you might be doing in your article. I think civil is what you call respect. Civil is what God requires of me. Respect is what others “earn”. Do you agree? I “Do Not” expect you to respond to me as you never have and are the ghost writer here much like a few others on the site. I think you should respond though because , IMO, you are dead wrong! There is a challenge to wake your pen up. Now, to be clear, I respect you, for you have earned that through what I have read over the years from your articles. I do not respect the enemies of the Cross. God does not expect them to obey Him, for without the Spirit of Christ, they don’t have the ability to follow Him. They are at the mercy of their sin nature, therefore, follow after their desires and lusts. See DocReits, “overcome evil with good.” This is the Christlikeness that we are called to as followers of Christ. And that is what Crystal is saying in her article. Romans 12:2 “Do not be conformed to this world, but be transformed by the renewal of your mind…” We are to influence through our love!! Jesus won us with His love, not condemnation, and we are to win people by our love and not condemning them. Your disdain is to be toward sin, not sinners. We are to be Jesus with skin on in whatever corner of the world God places us. I appreciate your kind reply and good Word you cited in contrasting good and evil. You are absolutely correct in what you said and quoted. “It is possible with the help of the Holy Spirit to respect other’s opinions with grace”. Remember the word “opinion” there Judebug. Let’s revisit my comment to Crystal. I said we should treat others who differ with us in a civil manner, but that is much different than respecting their opinions. Do you understand the difference Judebug? Let me make it clearer for us. I often speak with those who believe in abortion. I spoke about a month ago with a female patient of mine who believed not only in abortion through 9 months of pregnancy, but also that parents should have the option to kill their newborns during the first two years of life, after birth. “No kidding!”, your gasp right there and your unbelief is also what I was going through. I spent some time in trying to rationally explain to her why her opinion was in error, to no avail. Now here is my point. I treated her in a very civil manner and we parted at the end of her exam, but I in no way could I say that I respected her opinion. Her opinion was a vile thing that came up like bile in my throat! I hope that helped you Judebug, with the reason for my reply to Crystal, over this oftentimes confusing idea of the Christian’s duties regarding behaving in a civil manner(which we are called to do) vs respecting other’s opinions. Ok, DocReits, I see what you are saying about their opinions. But, you have to admit that this person wanting to kill babies, up until they are 2, is no new thing. Look in the OT! Not only did they want to, but they did burn children alive on alters! Those, without the Holy Spirit in them, can not reason Biblicaly and we should never expect a morale answer, or morale actions, from them. We should be shocked when they do give us a morale answer and not when they don’t. So, yes, don’t respect their sinful opinion but use each and every opportunity to lead them to Truth, but not to argue their evilness to them. Remember, yu too were once caught in your evil sinful nature, but God in His mercy, granted you repentance and redemption. The Holy Spirit’s the only one who can bring conviction and He comes to us to convict, convince, and convert a person. We are to show them Christ, tell them about His love and truth that comes to free us from sin and death, then get out of the way and let God Humble them under His mighty hand. Helps me h my bible study. Next post: Is the Concept of Having A Soul Mate Biblical?